Caiman appeal – animal team training begins! Caiman appeal update - animal team training begins! Last week our animal team visited Crocodiles of the World, to get some world class, hands on training. The session was led by Shaun Foggett, the Zoo Director and IUCN SSC Crocodile Specialist Group (CSG) Member. The team were shown how to safely approach, catch, handle and restrain a crocodile. They also discussed the enclosure design and feeding regimes. 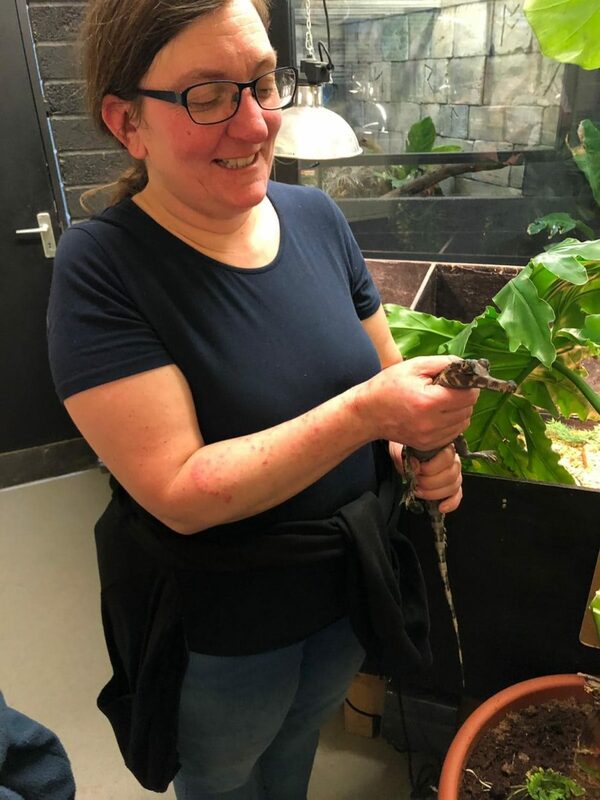 In the picture you can see our curator, Tina, practising her handling technique with a baby Tomistoma crocodile. When the caiman arrive at The Living Rainforest they will go into quarantine facilities before being moved into their new home. A massive thank you to everyone who has already donated to this appeal. We’ve still got a way to go, but it’s great to see we’re approaching the first £1000 milestone! As a token of our appreciation, donors are invited to have their name displayed on the exhibit, choose names for the caimans, and get an invitation to a special opening event. Be the first to know when there’s news or events at The Living Rainforest by subscribing to our newsletter below.